Implore no more / for what is, is no more. What is yours is to play the assigned part well. But to choose it belongs to someone else. Rehearse / reluctance with vehemence. The wavering scene / unwaveringly. A person’s master is someone who has power over what he wants or does not want, either to obtain it or take it away. Whoever wants to be free, therefore, let him not want or avoid anything that is up to others. All honor, steady bliss / comes from the peerless pear you raise / to your own lips. Give up on self-belief / you’ve got to seek / in crow’s feet / of another’s smile. 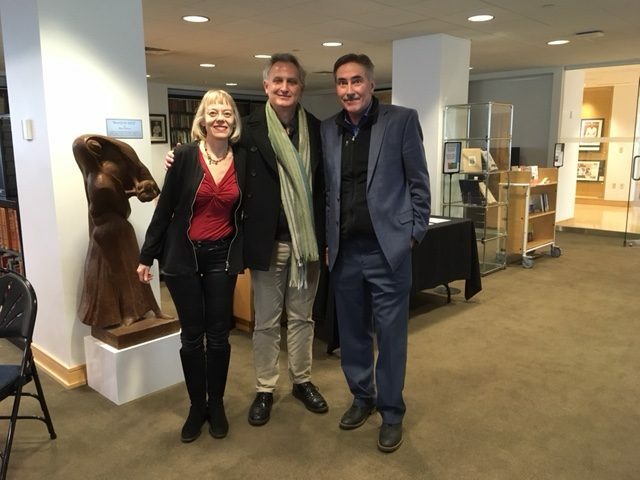 I had the pleasure of spending a day last April with Sharon and other aficionados at a one-day aphorism symposium in Hartford, CT, organized by Jim Finnegan, proprietor of the ursprache blog and genius loci of Tramp Freighter. (That’s us in the below pic.) Dolin read from Manual for Living and other aphoristic work that day, demonstrating her gift for deftly slipping Stoic wisdom into poems that succeed as both lyric and aphorism.